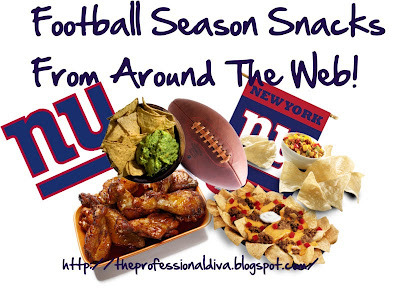 THE MARTINI CHRONICLES: Football Season Snacks From Around The Web! Football Season Snacks From Around The Web! Football Season Is Here!!! Am I the only one who's excited? I'm pretty sure I am not the only one! I mean, what's better than football season? And what's better than football season snacks? Look...I'm not going to even waste your time with all of this blogger chit chat...let's get right to it! I have trolled the Internet and compiled for you 8 of the most fabulous snack recipes just in time for football season. Whether you're an NFL or college football fanatic, these snacks are perfect for a football-watching crowd. Or just for you and your family. Okay seriously, enough chit chat. Here are the recipes. Enjoy! 1. Make the marinade. In a measuring cup stir together the hot sauce, ketchup, and molasses. In a medium bowl add the powdered sugar and the ranch dip powder. 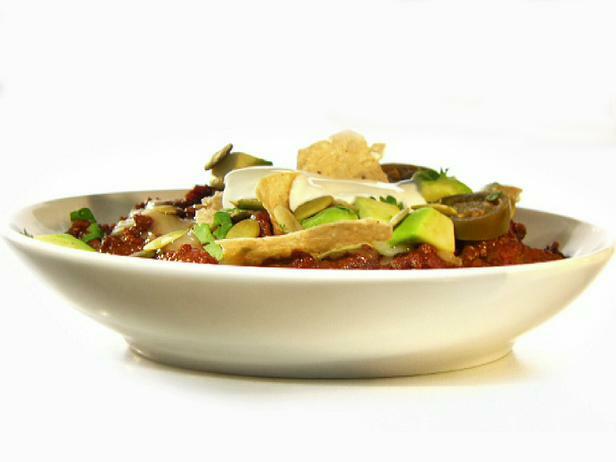 Add ½ cup of the hot sauce mixture into the bowl and whisk until the dry ingredients are completely blended without any tiny lumps showing. Pour this mixture back into the remaining hot sauce mixture in the measuring cup and whisk to combine. 2. Marinate chicken. Add chicken parts into a large resealable plastic bag (if needed, use two bags). 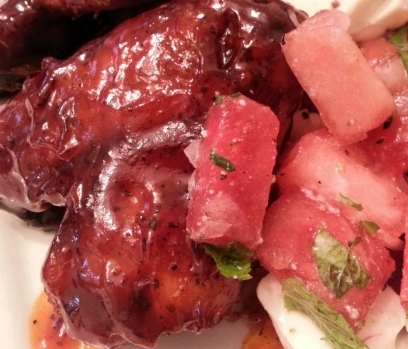 Reserve 1 cup of the marinade in a resealable container and refrigerate. Pour the rest of the marinade over the chicken in the large plastic bag(s). Press out all the air from the bag(s) and seal. Refrigerate at least 6 hours or up to 24 hours. 3. Rest chicken and make glaze. Line a baking sheet with parchment paper and spray lightly with cooking spray. Remove the chicken parts from the bag and shake off excess marinade before placing on the prepared baking sheet skin side facing up at least 1-inch apart (just like the bags, you may need two baking sheets to do this, or bake them in batches). Discard marinade in plastic bags. Rest the baking sheet at room temperature for one hour before you plan to bake them. 4. Bake and glaze the chicken. Preheat the oven to 350?F. Bake 20 minutes on the center rack, if using two baking sheets use the middle rack and the one just above it. Meanwhile, in a small saucepan bring reserved marinade from the container to a boil. Reduce by 1/3 until it thickens slightly, about 10 minutes. After 20 minutes, remove chicken from oven. Brush chicken with the glaze. Raise the oven temperature to 400 degrees and bake chicken until cooked through, another 20 minutes. 2. 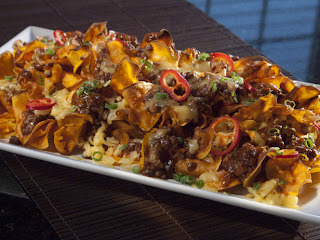 Layer half of the chips, pork, cheese, and banana peppers in a large baking dish; repeat with a second layer of each. Transfer to oven and bake until cheese is melted and pork is warmed through, 8 to 10 minutes. 3. Remove from oven and top with warmed queso. Garnish with scallions and cilantro; serve immediately with salsa. 1. Cut avocados all the way around with a sharp knife. Scoop out the pit, then spoon avocado flesh away from skin into a food processor. Add the juice of 1 lime, a couple of pinches salt, sour cream and chipotles in adobo. Pulse guacamole until smooth. Transfer to a serving bowl. 2. Heat a 12-inch nonstick skillet over medium high heat. Brown chorizo 2 to 3 minutes, then remove from pan. Add oil, garlic, then shrimp. Season shrimp with salt and pepper and cook shrimp until pink, 2 or 3 minutes. Transfer shrimp to a cutting board and coarsely chop. 3. Add a drizzle of oil to the pan and a large tortilla. Cook tortilla 30 seconds, then turn. Cover 1/2 of the tortilla with a couple of handfuls of cheese. 4. Arrange a layer of chorizo and shrimp over the cheese and fold tortilla over. Press down gently with a spatula and cook tortilla a minute or so on each side to melt cheese and crisp. 5. Remove quesadilla to large cutting board and repeat with remaining ingredients. 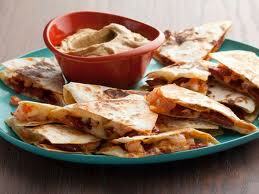 Cut each quesadilla into 5 wedges and transfer to plates with your spatula. 6. Top wedges of quesadillas with liberal amounts of smoky guacamole. 1. Place the ancho and guajillo chiles in a small saucepot and cover with the stock. Bring to a low boil, reduce the heat to low and simmer gently 10 to 15 minutes. Puree and reserve. 2. Meanwhile, heat the oil in a Dutch oven over high heat. Add the chorizo and begin to render the fat. Pat the beef dry with paper towel and sprinkle with salt and black pepper before adding into the Dutch oven with the Worcestershire. Cook until a nice crusty brown develops on the beef (the salt helps make a nice crust on meat). 3. Add the coriander, cumin, oregano, cloves, cinnamon, garlic, chile and onions and cook until the onions are soft. 4. Pour in the beer to deglaze the pan, scraping up any brown bits that have accumulated on the bottom of the pan. 5. Add the dried chili puree, masa harina and honey. 6. Reduce the heat to low and simmer to thicken and develop flavor, 45 minutes. 7. Serve with the toppings of your choice. 1. In a large saute pan, heat the butter over medium-high heat. Add the onions and saute, stirring occasionally, for 15 to 20 minutes, or until golden brown and caramelized. Add the shallots and saute for 8 to 10 more minutes, until the onions and shallots are dark brown. Add the garlic and saute for 2 minutes. Remove from the heat and let cool for 5 minutes, then chop the onion mixture into 1/4-inch pieces. Set aside to cool to room temperature. 2. 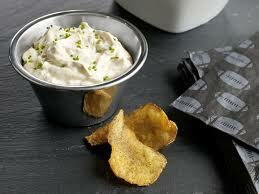 In a bowl, mix the sour cream, mayonnaise, celery salt, Worcestershire sauce and 1 teaspoon each salt and pepper. Fold in the onion mixture. 3. Refrigerate at least 1 hour or overnight. 4. Garnish with chives and serve with potato chips. Courtesy of: Aaron McCargo Jr.
1. Preheat the oven to broil. Preheat a deep-fryer or heavy-bottomed pot, with enough canola oil to come halfway up the sides of the pot, to 325 degrees F.
2. Working in batches, deep-fry the sweet potatoes until crisp, about 5 to 7 minutes. Remove from fryer to a paper towel lined platter and season with salt and pepper, to taste. Set aside. 3. Add the grapeseed oil to a large sauté pan over medium-high heat. Add meat and brown it until almost cooked through, about for 3 to 4 minutes. Add the onion and garlic and cook until softened, about 2 to 3 minutes. Add the tomato paste, chipotles, and salt and pepper, to taste. Stir several times to incorporate. Add the BBQ sauce, bring to a simmer and cook for an additional 5 to 6 minutes. Remove from the heat. 4. 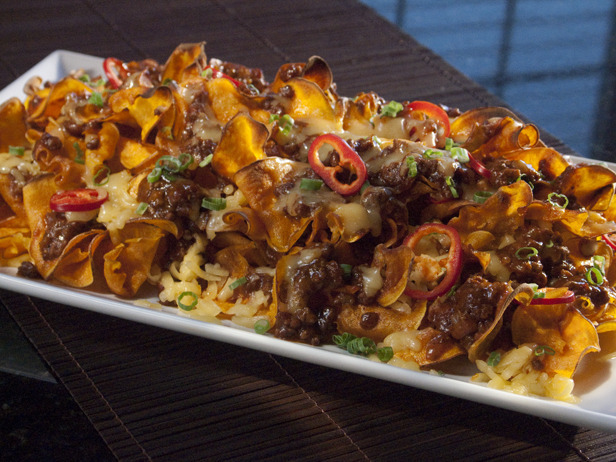 To assemble nachos: Using 2 oven-proof platters, lay some sweet potato chips on each platter. Top the potatoes with some meat, cheese, and jalapenos. Repeat the layers with the remaining ingredients, except for a handful of jalapenos. Broil until the cheese melts, about 3 to 4 minutes. 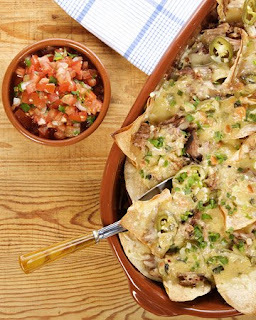 Remove the platters from the broiler and top them with the remaining jalapenos, a drizzle of BBQ sauce and the scallions. Serve. 1. 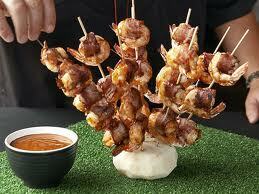 Soak 5 to 8 bamboo skewers in water for about 20 minutes to keep them from burning on the grill or under the broiler. 2. Meanwhile, cook the bacon in a large skillet until halfway done, about 4 minutes. Drain and cool on paper towels. Wrap a piece of bacon around the middle of each shrimp; skewer with bamboo through the point where the bacon ends meet to keep it from unraveling. Thread 3 to 5 shrimp on each bamboo skewer. 3. Puree the barbecue sauce, oil, lemon juice, mustard, chipotles, red pepper flakes, cayenne pepper and 1/4 teaspoon freshly ground pepper in a blender. Set aside half of the sauce for dipping. 4. Preheat a grill, grill pan or broiler. Grill or broil shrimp (on a foil-lined baking sheet, if broiling) for 5 minutes, basting with the sauce once they begin to turn pink. Flip, baste again and grill or broil until just cooked through, about 4 more minutes. Serve with extra sauce. 1. 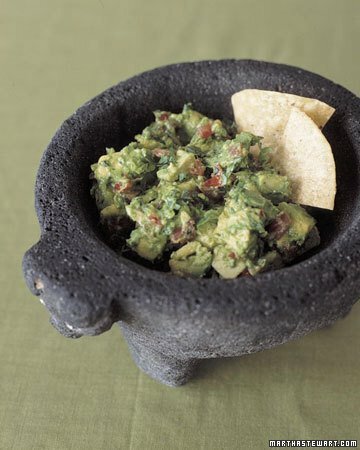 With a large mortar and pestle, mash onion, 1 tablespoon cilantro, jalapeno, and salt until smooth and juicy. 2. Add avocado, and mash slightly (avocado should remain somewhat chunky). 3. Stir in tomato and remaining 2 teaspoons cilantro. 4. Season with salt, if desired. Use immediately.